The attack on a tunnel complex in remote eastern Afghanistan with the largest non-nuclear weapon ever used in combat by the U.S. military left 90 Islamic State militants dead and no civilian casualties, Afghanistan officials said Friday. The U.S. maintains over 8,000 troops in Afghanistan, training local forces and conducting counterterrorism operations. Over the past year they have largely concentrated on thwarting a surge of attacks by the Taliban, who have captured key districts, such as the Helmand province, which American and British troops had fought bitterly to return to the government. But on Friday, however, the U.S. military appeared entirely focused on the Islamic State group. “This is the right weapon for the right target,” said U.S. Gen. John W. Nicholson, NATO commander in Afghanistan, at a news conference. Gen. Daulat Waziri, spokesman for the Afghanistan Ministry of Defense, said 36 IS fighters were killed by the balst, and that the death toll could likely rise. He said the bombing was necessary because the tunnel complex was extremely hard to penetrate, with some as deep as 40 meters (43 yards). Pakistani villagers living near the Afghan border said the explosion was so loud they thought a bomb had been dropped in their village by U.S. warplanes targeting terrorists in Pakistan. Wali said dozens of other villagers also came out of homes and later he went near the border, where he met with other residents. He said he could see smoke in the sky. Another Achin resident, Mohammad Hakim, voiced his approval for the strike, saying “We are very happy and these kinds of bombs should be used in future as well, so Daesh is rooted out from here,” using the Arabic acronym for the Islamic State group. “They killed our women, youths and elders sitting them on mines. We also ask the Kabul government to use even stronger weapons against them,” Hakim added. “I want a hundred times more bombings on this group,” said Hakim Khan, 50, a resident of Achin district, the site of the blast. Inamullah Meyakhil, spokesman for the central hospital in eastern Nangarhar province, said the facility had received no dead or wounded from the attack. District Gov. Ismail Shinwari said there is no civilian property near the airstrike location. There was no immediate comment from the Islamic State group on the attack. The Site Intelligence Group, which tracks extremist organizations, reported Friday on a statement from the Afghan Taliban condemning the U.S. for its “terrorist” attack. The statement said it is the responsibility of Afghans, not the U.S., to remove the Islamic State group from the country. 36 Islamic State Militants Dead by Giant GBU-43B Bomb, commonly known as the Mother of All Bombs. 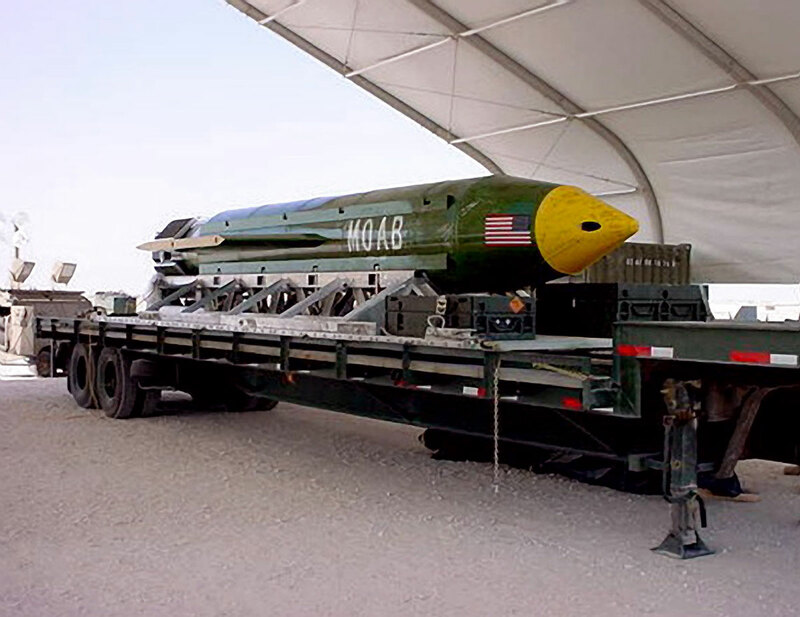 It was dropped in Afghanistan to destroy tunnels & caves.